Gingerbread House Bakery in Frisco on Rt12 - (252) 995.5204. Eat in, Take out, Delivery. We go to Gingerbread a lot for pizza – so far, we agree with their sign “the island’s best pizza.” They also have a small salad bar with fresh ingredients and (even better) dark green leafy vegetables, not just the usual tasteless iceberg. It’s a good value too, but they are not open on Sundays. The baked goods are also good eats and my favorite is the gingerbread or maybe one of their chocolate brownies. Island Secret - We have also been the lucky recipients of the bakery’s closing time disposal program whereby they sometimes pack up sweeties in a box and send them out the door with us – sure they have probably reached their expiration (or close to it) but the divers on our boat never know the difference! Kat"s Deli - Go see Kat for the best sandwiches in Hatteras! Kat's deli makes a variety of deli standards but takes them up a notch. They also serve a number of house specials that you can't get anywhere else. Truly Gourmet, Artisanal sandwiches and Panini's. Everything I have eaten here was excellent and one of my personal favorites is the Oniontended Consequences. Kat's is located in the "Stowe on 12" center where Fat Bellys is, on sound side just as you come into Hatteras from the North on rt 12. Hatterasman Drive In - (252) 986-1005 - Hatteras Village Rt12 and Eagle Pass- This Icon of Hatteras eating has changed owners a few times over the years and therefore the menu has changed as well. This has again happened and the new owners, the Millers, have taken it back to the origins and once again do a great burger along with some other very good choices. The fresh fish sandwiches (always local caught fish) are a huge hit with us, plus every sandwich comes with those tasty shoestring fries that are "just right crispy". They have added ice cream treats and really great milkshakes to the menu as well. This is a perfect place to get your quick lunch and then get back on the beach - good $ value and good eats! Harbor Deli - Located at Hatteras Harbor Marina right in the village, they make some great sandwiches – you can pre-order and pick up before going out on the boat by calling 252-986-2500. The deli has been remodeled with with new seating and even A/C on the deck so you can enjoy the view of the harbor while enjoying the food! Plus, if you need a cake for any occasion, they make some really delicious and inventive cakes. Hatteras Sol - Is at Teaches Lair Marina and serves lunch and dinner. It is very popular as food and drinks are good. The view from the dining room and deck is out onto the sound with great sunsets. It greats crowded fast and you may have to wait awhile to eat, but a drink on the outside deck is the answer to that problem. Breakwater at Oden's Dock - The original upscale restaurant in Hatteras Village. The menu is a bit limited but everyone will find something to enjoy and the food is consistently good with prices that average out to around $30 per diner. The dining room is somewhat small and the wait can be long for a table on the weekend so I have eaten at the bar many times without having to wait - same food, just sitting on a bar stool. You can also wait on the outside deck that overlooks the marina while enjoying a glass of wine listening to the live music. Dinky's - 252-986-2020 - Located right in the middle of Hatteras Village upstairs at the Village Marina, Dinky's serves a very good dinner and always has an excellent special-of-the-day along with soup-de-jour that is often unique and delicious. They also have some of the best crab cakes on the OBX and I know my crab cakes. Friday night is usually prime rib night if you are a carnivore. Nice view out over the harbor and great sunsets along with a good selection of beer and wine to round out your meal. This restaurant is very popular with the locals and is a moderate cost on par with the Breakwater. They will grill up your personal catch for a reasonable cost too. Rusty's Surf and Turf - 252-995-4184 - Located in Buxton, Ocean side, at the entrance to Buxton Center they serve up dinner with a very good selection of well prepared dishes. I have eaten here many times and tried a variety of different items and each was exceptionally good. The Hereford steak was cooked exactly right with a perfect balance of seared outer and tender center to an exact medium just as ordered. The scallop dish - Beach Bum Scallops - was equally well executed. The scallops were cooked to perfection then served with a sauce that was both original and extremely tasty. The dish came with sides of perfectly cooked veggies and mashers that made the meal complete. I have also tried several of the appetizers and found them all really good, with the coconut Mahi fingers being my favorite. Wait staff has been very attentive and knew the menu well. Even the owner Rusty (yes he really exists) stopped at the table to make sure things were OK. I think Rusty has raised the bar for Hatteras dining. Buxton Munch Company - 252-995-5502 - Yes, walk back into time (the 1970's) when you step in the Munch but enjoy the ambience, the food, and the super-friendly owners. This sandwich shop is located in the Buxton Center on Rt 12. The Munch serves a variety of really good lunchtime eats; however, don't go there if you need fast food because everything is made to order and well worth the wait. Their wraps are super and served with fresh made tortilla-strip chips and the best salsa we've tried on Hatteras Island (Marcy - sell this by the bottle, girl). One of my favorite sides is their beans and rice served up with some Crème Fresh - yum! The fish comes from local stock and is cooked in your choice of methods into salads, wraps, sandwiches or dinner platters and is all consistently delicious. This is an excellent choice for lunch, but not open on Sundays and only one night a week for dinner. Capt. Rolo's - Finally, after sitting vacant for several years, the former Bubba's BBQ spot is morphed into a restaurant that would make Bubba proud even though he would never recognize the interior of the place now. Like most true good eats this side of Oregon Inlet (and I'm thinking of the Buxton Munch and the Hatterasman), don't be fooled by the building exterior. This place had a complete makeover inside, is really nice and clean, and has a full service bar. The menu is pretty standard for this area and we will get around to trying out the various menu offerings; however, you can't go wrong with the fish-of-the-day. I had the flounder basket - a nice large flounder with tasty coleslaw and fries as well as the ubiquitous "golf-ball" hush puppies. Rolo's has excellent, friendly service and our food has always come out fairly quick. Capt. Rolo's is located in Frisco, 53060 Hwy 12, sound side on Rt 12. Ocean Bistro (Avon) The Bistro is popular for all the right reasons but has a small dining area and bar so the chances are good that you will have to wait; on our last visit, we shared our table with another party (NBD). The staff is really friendly and the food is worth waiting for. They have specials plus the usual seafood, salads, etc. The deserts are pretty impressive. Uncle Eddie’s in Buxton is hands-down the best, sound side middle of Downtown Buxton, look for the neon sign. Eddie's has superb milkshakes of all flavors and creamy custard in primary and flavors of the day all made right on the premises. The Hatteras Hurricane can contain an endless variety of additives - after all "there are no rules here." A coffee house (coffee is good too!) and reading room as well as mini-golf course round out the fun. Hatteras SnowBalls has moved from sound side in Frisco to ocean side further north, just up the road. Their name says it all, nothing like shaved ice and sticky sweet syrup but also has good ice-cream. Robinson General Store in Hatteras has a variety of packaged treats, Klondike and Dove bars, plus adult beverages of the fermented variety a plenty. Orange Blossom Bakery - The Orange Blossom is open in the mornings for breakfast pastry and has some very good biscuit sandwiches. The house specialty is the "apple ugly" which is worth a try for sure, and is even good the second day (yes, we have bought day old uglies and ate every crumb). Located in Buxton on 12, sound side. Sand Bar and Grill - Relocated (thanks to Isabel) to a larger building that used to be the Soundside restaurant in south Buxton. It actually was more fun at the old location that got blown away in the storm but here they serve much better food and the view out to the sound is great. The selections range from salads to seafood and land fare and all is reported to be very good. The crab cakes are good enough to order and enjoy again. Downstairs they have a pizza shop and game arcade, plenty of parking. Dancing Turtle Coffee House - In Hatteras Village next to Sonny's, Great Coffee and morning snacks. There are basically three choices; Burris Red&White in Hatteras Village for essentials along with Connors in Buxton but you will get an increased selection of groceries if you go up to Food Lion in Avon. The American Boy's Club is in Buxton in the same center as Buxton Munch, Beer and Wine available everywhere. The Robinson General and Food Lion both have a pretty good wine selection and the Burris has a whole isle full of your choice of beers. RIP section: recent restaurant closures listed just so you don't go looking for them. RIP -Teach's Island Bar and Grill - Located in the Village at Slash Creek in the old Channel Bass spot, this is a new location for this restaurant for 2013. They had been at Teach's Lair Marina, but outgrew that space and have moved to this location. RIP - Finnegan's Dining Haul. (Buxton/Lighthouse Rd) We ate there a few times; most notably during one New Year's Eve (I'm sure we had a good excuse at the time) and listened to live music from a Jerry Garcia look-alike. Anyway, they had lots of refrigerated beer. RIP - Hurricanes - (previously Finnegans) Closed and empty to the walls, Dec 2013. Even the paint job couldn't save this place. Was in Buxton right at the Lighthouse Rd. RIP - Cafe 12 - This was located in the Food Lion S/C in Avon, and used to have the weird name of "The Pickled Steamer." Name was changed along with the owners and they moved to more space a few doors down. Now they are closed for good. We are hoping that the old Pickled Steamer folks will come back - those Hatteras Flats were the best; never had a disappointing meal. 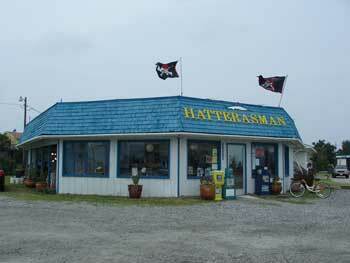 RIP - Channel Bass - This icon of Hatteras eateries was sold in '06 and renamed to "Captain Jacks" but then closed in the first season, and came back again with the original name! However after just one season it is now closed again and for sale. It was Teach's Bar n Grill for a short time and now it is gone for good as the building was demolished in 2107. RIP - Buoys - Located in downtown Buxton, Buoys went away over the 2008 winter. Rusty's is in the space now and is a great place to eat. RIP - The Shrimp Shack in Hatteras Village on Rt12 - Went by just the other day and the sign is gone and it looks empty. Looks like it will change names once again as it was the old "Fish Tales / Garys" space. It finally became Outriggers but they closed after just 3 or 4 months and the place after sitting empty for a season became "Midvales." RIP - Midvales - I don't know, was it their sign (a hand-drawing of a door)? I don't think even Robert Irvine could have pulled off a makeover here. This one didn't last long and the building is now empty again (Fall 2013 to present 2018). RIP - Sooey's BBQ and Rib Shack - OH NO! Sooeys in Frisco has joined the RIP section, but the other three locations; Nags Head, Duck and Corolla that seem to be still around - but they have abandoned us South of Bonner Bridge. I liked them enough to leave the description here - The name says it all! This is NC down east style BBQ that is really very good. Chicken, Pulled Pork, Beef available, but my favorite is the Pulled Pork. Their vinegar based sauce is just right and the sides won't leave you disappointed either, especially the beans. They always have a fish dinner special and it is usually the fresh caught local fish. RIP - Austin Creek Bakery - It used to located in Hatteras Landing Marina but is now closed and gone for good. The only bakeries are the Gingerbread and Orange Blossom. RIP - Wahine's Surf Grill - This spot was located in Buxton at the very North end on the sound side just before the "skinny part" of the island. They are now closed and the Island Perks coffee shop has opened in this space. Now they are RIP and Fattys is in this space. RIP - Austin Creek Grill at Hatteras Landing Marina – The Austin Creek is now closed and "Dirty Dicks Crabhouse" is open in this space. Crabhouse is RIP too and moved up to Avon. RIP - Gringos Tacos at Hatteras Landing. A small building centrally located on the dock. They had assorted tacos (beef, chicken, seafood) that was inexpensive and go down easy with a nice ice cold beverage.